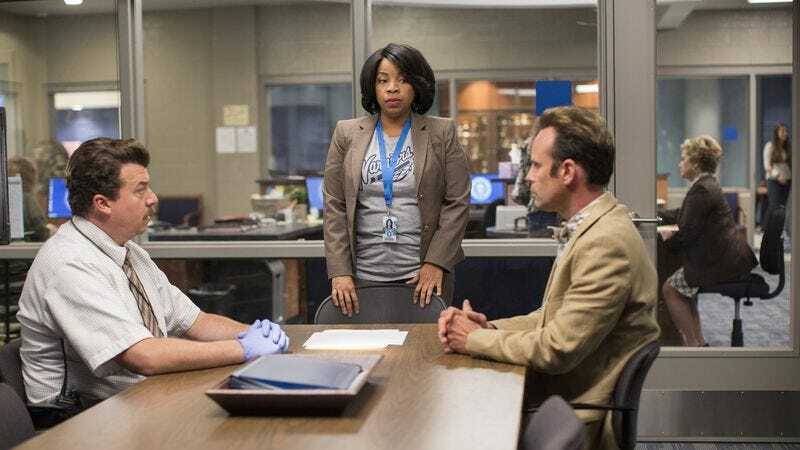 In my review of last week’s series premiere of Vice Principals, I came away with one conclusion: there needs to be more chaos. That critique didn’t come from a place of wanting to see more vulgarity and chaos just for the sake of it, but rather an observation rooted in character dynamics. The premiere showed that the team/rivalry of Neal Gamby and Lee Russell was brimming with potential for off-the-wall black comedy similar to Jody Hill’s Observe And Report. Danny McBride’s Gamby is clearly hiding some inner angst and frustration, a man who’s played by the rules his whole life only to see that following the rules doesn’t mean always getting what you want. Then there’s Goggins’ Russell, a Southern Dandy who oozes charm, but is more a snake in the grass than his straight-edged counterpart. The premiere hinted at the potential collision of forces, but never really gave Gamby and Russell, and subsequently McBride and Goggins, room to explore the mess that would come from such a collision. In “A Trusty Steed,” Dr. Brown’s house burns to the ground. Chaos reigns. Dr. Brown’s house doesn’t just spontaneously combust though. Rather, it’s the mess caused by the collision mentioned above. With Russell and Gamby deciding to join forces for the time being at the end of last week’s episode, that sets the stage for this week’s reluctant partnership. The two begin with a meeting in the forest behind the school—the resident meeting place of stoners in days of old, now one for vice principals with a grudge—where they trade personal jabs as quickly as they do ideas about how to take down Brown. Adorned in a star-spangled vest and motivated by Brown’s insistence on coffee with two creams and four sugars, Russell puts a plan into motion. He’s created a file on Brown, and after Gamby’s apparent photographic memory fails to see the insight contained within, Russell lays out the importance of the file: Brown has fired nearly every vice principal in every school she’s taken over. 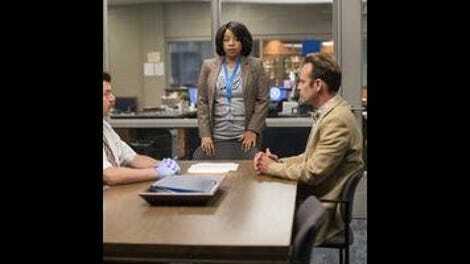 Giving Russell and Gamby such clear stakes and conflict is a smart move on the part of Vice Principals. If the show is going to lean into its vulgar and chaotic tendencies—as it should—it needs to keep the stakes low-key. There’s no need to turn Brown into a supervillain, or concoct some sort of elaborate reason why Gamby and Russell might want her gone. Instead, the dark comedy should come from a simple source: two men upset that they didn’t get what they wanted. Whether that makes Russell and Gamby protagonists of any sort is debatable, but there’s certainly potential in keeping the motivations clear. Russell and Gamby are outsized characters, but what makes them work on the screen and in the story being told is the fact that they’re insecure and incapable of dealing with their own emotions. What “A Trusty Steed” starts to expand on is the idea that Gamby and Russell are both entitled, privileged men. They believe they’ve each put in the work to be awarded the position of Principal, and that leads them to wage war on Dr. Brown. Never mind that they discover all sorts of awards and accolades when they break into her home, and that she’s clearly more qualified than the two of them; that doesn’t matter to men like Gamby and Russell, who believe that they’re rule-following and charm should get them whatever they please. There’s a casual, and sometimes not-so-casual, sexism in their behavior, and part of the show’s cringe comedy is in recognizing that their entitlement is in part a symptom of their dated worldview. That doesn’t mean that Russell and Gamby are necessarily sexist, or even that the show is all that interested in exploring gender dynamics in the workplace. But, much like Silicon Valley, there’s comedy in acknowledging the narrow vision of the protagonists. So, when Gamby tells a driving student that “driving doesn’t come naturally to women, but I’m surprised by your abilities,” it’s a line that provides a little insight into who Gamby is. Simply, he has a problem with women. He’s recently-divorced, his ex-wife has moved on and is dating a guy who’s into motocross, and now a woman takes the position above him at the school he’s dedicated years of his life to. Gamby is feeling emasculated, and Russell recognizes it. One of the more intriguing aspects of the Gamby-Russell relationship is just how much of a hold the latter seems to have on the former. When Russell convinces Gamby to head over to Brown’s house to root through her trash to get some dirt on her—payback for her bringing in a man, with the hilarious name of Blythe Saison, to evaluate their performances—it becomes clear that Gamby is in over his head, that he feels the need to prove something to Russell, the more carefree, unhinged of the two. So, he wraps his tie around his fist and punches through the glass door while Russell eggs him on with astonished calls of “no, no you won’t.” This is the dynamic that will keep Vice Principals fresh going forward, and distinguish itself from the obvious comparisons to Eastbound And Down. When “A Trusty Steed” really lets loose, it engages with the kind of darkly funny comedy this show needs to succeed. There’s great catharsis in the scene where Russell and Gamby destroy Dr. Brown’s home. “What kind of people have nothing to hide?” says a disgusted Russell before he shows a “World’s Best Principal” mug to Gamby in order to enrage him. Like I said, he knows Gamby’s insecurities, and he’s going to use them to pursue his own selfish goals. That’s a promising direction for the show to head in, especially if Gamby catches on, creating an all-out war between him, Russell, and Brown. The series premiere was fun but wanting; “A Steady Heed” sees the show finding its gloriously unhinged footing. Can we get more Busy Philipps, please? “You’re the one trying to make friends the most.” Yeah, Gamby has some insecurities. “She told me I ate pubic hair with pepper paste.” Goggins and alliteration are a fine duo.